If you spend any time at all on Facebook, you’ll inevitably see a friend post about the passing of a beloved pet. Friends chime in with their condolences and their own stories of dealing with the death of a cat, dog, horse or even a lovable lizard. Pets are such a part of the family – they nap on the couch and sleep on the bed. We put their faces on our holiday cards and snap quick pictures of them patiently enduring a game of dress-up. The loss of a pet runs deep within a family. And, for children, it can be a particularly profound loss. It’s not unusual for couples to have a dog or cat before they add any human children to their home. So, many children are introduced to the family pet the very day they come home from the hospital. It’s important to help your children through this loss and understand how deeply it can impact them. Here are 5 ways to help guide your child in this time of grief and turn the loss into a celebration of a special friend. This can be in your backyard or at a favorite dog park. It can be family only or you may want to invite some close friends. Give everyone – including the children – the opportunity to share a funny or happy story about the pet. Use the time to focus on the joy your pet brought to the family. Give to a local animal shelter, a rescue group or other cause in your pet’s memory. You could also dedicate a park bench at a place that was special for your family and deceased pet. This gives you and your children a place to visit and reflect on those happy memories. Young children, in particular, may have a difficult time understanding, but don’t sugarcoat the situation by using terms like “Fido ran away” or “Fluffy went to sleep.” Those can be confusing for little ones, so share with them as best you can the concept of death and then answer what’s sure to be several questions. For many children, the death of the family pet may be their first experience with death. This is an opportunity to let them know it’s OK to grieve. They may feel sad, angry or confused – all of which are normal. Gather favorite photos of your child with the pet and create a photo book or framed collage to hang in their room. If you choose to have your pet cremated, a portion of the remains can be made into a piece of jewelry or pendent. Grieving the loss of a pet is a full family experience. Pets are constant companions in the home and everyone feels their absence. 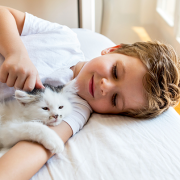 The whole family will need time to adjust and work through the grieving process, but focusing on the many ways your pet made your family better can help ease the saddens for the children – and the parents. Stuhr Funeral Home, a trusted name in funeral service for more than 150 years, is proudly partnered with Pet Rest Cremation Service to provide pet loss care to the Lowcountry community. Together, they’re dedicated to providing the best and most professional services possible to clients during their time of grieving and healing. For more information, stop by one of our locations in the area or call (843) 723-2524.